NOTE: This home is more than 60 miles/100 km from the lava flow that was on the other side of the island until October 2018. There is no chance of the lava reaching anywhere close to here. Why settle for a crowded condo when you can stay at a beautiful custom built home? You will be only minutes away from some of the top beaches, resorts and golf courses in the world! 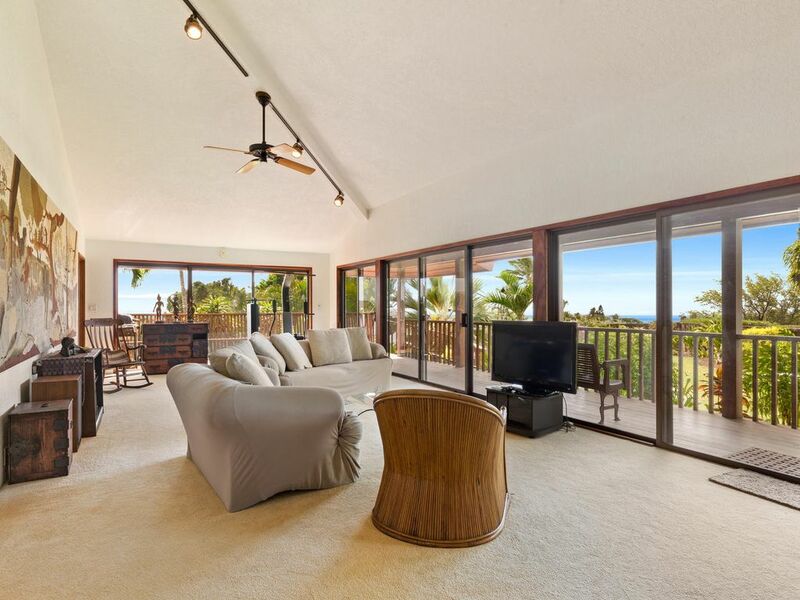 From Alaua Hale (ah-la-uu-ah hah-lay) you'll enjoy beautiful ocean sunsets and views of the island of Maui, Kohala Mountains, Mauna Kea, Mauna Loa and Hualalai from this exquisite custom-built Waikola vacation rental house! Although up to 5 guests can be accommodated, the floor plan, affordability and romantic ambiance make it very popular with couples too. This very comfortable vacation home has everything you'll need. It is located in Waikoloa (pronounced: why-koh-low-ah) Village, on the west side of the Big Island, about 30 miles north of Kona. The island's best white sand beaches, championship golf courses and the Dolphin Quest at Hilton Waikoloa are only a short 10 minute drive away. And the house is very inexpensive compared to the resort hotels! Relax on the large lanai and soak up the views. You'll really enjoy the manicured tropical landscaping. We have provided free high-speed WiFi Internet access for those folks that want to bring a laptop computer to stay connected (and to share your awesome vacation photos)! Discount golf passes are available for our guests at the Robert Trent Jones-designed golf course. This beautiful course is only a couple of minutes from the house. Many of our guests are attending weddings or conventions at the resort hotels such as the Hilton Waikoloa or the Orchid at Mauna Lani. Our Alaua Hale guests are also able to have free access to the swimming pool and tennis courts at Waikoloa Village Golf Course and can get a discount at the Robert Trent Jones, Jr. designed course. We have beautiful properties in Waikiki. Let us know if you are spending part of your holiday in Honolulu. We chose this location because it is near some of the best beaches in the world, fantastic golf, and has gorgeous views. We like to go to the resorts and beaches that are only 10 minutes away and then come home to a quieter and more private and peaceful setting. Waikoloa is a very sunny area so almost every day is a good beach day. Because circumstances require that we now spend a lot of time in Japan we turned our home into a vacation rental so others could enjoy it. The house is decorated with exotic items from my many travels such as batiks from Sri Lanka, antiques from many parts of the world and, of course, items from Japan. Our guests receive discounts for golf, easy access to some of Hawaii's best beaches, the fine restaurants at the resort hotels. You will know that you are not staying in a run-of-the-mill rental but a home that was custom built with love. toilet, tub, shower, Cedar walls, Koa cabinets, bathtub with shower. Both bathrooms have redwood walls. Master has double sinks. View of Mauna Kea, Kohala Moutains, Mauna Loa. On clearest days, mountains on Maui.